﻿ A Pocketful of Tips to Boost Your Small Business » Red Mango Marketing! I’m a collector. Some might call me a hoarder, but I haven’t filled my living room with boxes of unopened Hummel figurines purchased during any late night cable shopping sprees. No, I collect business tips. Usually, they are big enough that they can command an entire article in this space. However, sometimes I end up with a pocketful of smaller tips that are more or less unrelated to each other. Today I’m going to dump them out on the coffee table and share them with you so they’ll stop burning a hole in my pocket. I may want to develop some of these tips a little more deeply in the future, but I didn’t want to keep them all to myself any longer because I think they will prove very useful for many of you. I’m starting out with a rather technical issue, but it can be critical for your SEO. Here’s the problem: Sometimes you have the exact same content “filed” under several different headings or categories on your website. If those different pages use a different URL for the same content, it can cause search engine problems for you. You need to have content filed under one URL and then have the secondary pages (different categories, etc.) point back to that single URL. As I said, this is a bit technical, but if you’re with me this far you probably understand enough of the issue to check it out and see if you have this problem. Check out this resource from Moz for a good overview. If you’re technically savvy, you can set up canonical URLs yourself — or find a good web developer to fix your site structure. Tip: If you need website help, Constant Contact partners with a number of certified professionals to help you with web design, development, and hosting. Find someone to help you here. 2. Get an “authority” to promote your site. I’ve written before about improving your “celebrity status” and authority, and finding ways to “ride on the coattails” of established authorities is one way to do this. Here’s an easy strategy to pull authorities onto your website: Ask them to curate material around a topic for you. One way to do this would be to ask an authority to name his or her five favorite business books, 10 favorite blogs, etc. You can even offer to organize the article. Put the authority’s by-line on it, feature it in your social media with the authority’s handle and you’re well on your way to getting that free coattail lift. By the way, this is a tip that I think can be developed into a longer article and if you have any ideas you’d like to share to get authorities on your team, put them in the comments below. 3. Jump on new social media platforms. New social media platforms are being launched every year. The emergence of Blab comes to mind. Not all will be wild successes, but you shouldn’t always wait around to find out which will become the undisputed champions. Here’s the deal: It’s much easier to get noticed on a new social media platform than on an established platform. Further, the founders of the new platform might even notice what you’re doing and you can get yourself featured in their promotional materials. Of course, if the platform turns out to be a dog, you can just move on. 4. Generate revenue from your blog. Try a modest “up sell” from your blog. Find your most popular blog and connect “up sell” content to it. Something like an excellent check sheet, spreadsheet, white paper, or video module works well as content that enhances a blog you’ve written. Just be sure the blog stands alone and the added content is worth the price you decide to charge. If you keep doing the same thing, you will invariably get the same results. Look for areas where you can shake things up, and do this throughout your small business. For Hollywood celebrities, there’s an old adage that any publicity is good, even if it’s negative. The reason this is (somewhat) true is because it is so difficult to get noticed; therefore, even negative attention is better than not being noticed at all. For small businesses, the takeaway is to find some rules to break, some sacred cows to sacrifice, or some controversial positions to take that will make you stand out from the crowd. Don’t be afraid to challenge existing best practices if there’s another angle that works for your business. There. I’ve cleaned out my pockets a little. Now I’ll have room to stuff them full with some more tips. Let us know what small business marketing tips you’ve accumulated over the past months or years. Share your tips in the comments. 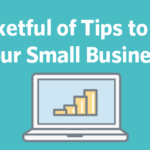 The post A Pocketful of Tips to Boost Your Small Business appeared first on Constant Contact Blogs. This entry was posted on Monday, June 6th, 2016 at 9:00 am	and is filed under Business Tips, Fresh Insights, News & Updates, small business marketing, Small business tips. You can follow any responses to this entry through the RSS 2.0 feed. Both comments and pings are currently closed.